Knowing how to grow petunias can give your garden bright, continuously blooming flowers from spring to frost. Found in a wide variety of colors, petunias are well-suited for growing in flower beds, borders, window boxes, and other containers. Cascading varieties work especially well in hanging baskets. 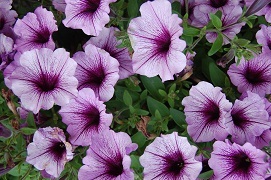 1 Explore the four main categories of petunia to determine which kinds will work best for you. Grandiflora have the largest flowers and are the most commonly-used type of petunia. Some have single blooms while others are doubles and are available in both upright and cascading varieties. Multiflora petunias have smaller flowers but have masses of blooms and provide big splashes of color. Milliflora grow close to the ground and have small flowers. They are easy to control and thus work well as an edging plant. Ground cover petunias spread and trail along the ground, from window boxes, and cover large areas quickly. This type will need more frequent watering. 2 Purchase petunias that are not long and leggy. Look for healthy green foliage and plants that are compact and stocky. Plant them when all danger of frost is past. 3 Consider growing petunias from seed. Start your seedlings about 10 to 12 weeks before you plan to plant them. Spread the tiny seeds on top of fresh damp potting soil or sphagnum moss. Press them into the potting material gently and water with a fine mist. Cover with clear plastic wrap and store in a bright warm spot away from direct sunlight. Move to a brighter cooler spot after they have sprouted. Remove the plastic. Use florescent lights to ensure at least 16 hours of light a day. Transplant seedlings into individual peat pots when they each have 3 leaves. Feed them diluted liquid fertilizer until frost danger is past and you can plant outdoors. Be sure to plant in moderately fertile well-drained soil. 4 Maintain constant blooming of your petunias during the season by pinching off faded blooms (deadheading). Multifloras won't need deadheading. Trim the plant by a third if it becomes too scraggly and isn't blooming well. That will encourage new growth and vigor. 5 Reduce fertilizer if the foliage looks vigorous and healthy but your petunia isn't blooming well. Most petunias need a good watering once a week unless it is very hot or if the petunias you are growing are in a container. 7 Control disease and pests that you might encounter when growing petunias. Avoid soft rot and mold by planting rain resistant varieties such as multiflora. Rid them of aphids by spraying the plants with a strong blast of water. Watch for small black droppings and holes in leaves and buds which may indicate caterpillars are after your petunias. Treat with environmentally friendly insecticide. 8 Insure success when planting petunias in your garden by placing them in a sunny location. They can tolerate some shade but require at least 5 to 6 hours of full sun a day, and more sun is even better. Article provided by wikiHow, a wiki building the world's largest, highest quality how-to manual. Please edit this article and find author credits at the original wikiHow article on Grow Petunias. Content on wikiHow can be shared under a Creative Commons License.